British royalty and the line of succession is an area of minimal knowledge for me. I wanted to watch the PBS miniseries, but I always prefer to read the novel first. The novel begins when Victoria is on the cusp of ascending to the throne. Her uncle, the king, is in ill health and she is in line to rule one of the most powerful countries in the world, but not everyone is happy to have the youthful woman as the monarch. Her other uncle, the Duke of Cumberland, works behind the scenes to do everything possible to steal the crown. Other forces are at work to ensure Victoria does take the throne, but will be a puppet for others' political agendas. None of the men in Victoria's world expect her to stand on her own two feet. Victoria, though small in stature, is not one to be bullied. Becoming queen allows her a measure of freedom that previously has been denied her by her mother and her mother's controlling personal secretary, Sir John Conroy. For once in her life, Victoria is at the helm of her own destiny. The remaining portion of the novel focuses on Victoria's days as queen and later her relationship with Prince Albert. In many ways this novel is Victoria's coming of age story, but it also provides an in depth look at the United Kingdom during the mid-1800's. As someone who has largely studied US History, I enjoyed comparing what was happening across the pond during Victoria's reign with what was happening within my own country during the same time period. Reading this novel helped me form a new appreciation for Victoria. She fought against traditional gender roles in a time when it was unpopular for women to think for themselves. Her actions defined her nation and while she made mistakes, she learned from these wrong turns and used them to influence her future decisions. She cared deeply for her people and wanted the best for her country. I also loved seeing the human, down to earth side of the famous queen. In particular, I was drawn to her fondness for her spaniel, Dash. While the novel focuses on Victoria in her youth, I craved more information. I was astonished to learn that she reigned for 63 years; her reign was only recently surpassed by Queen Elizabeth II. Her tenure was a time of transition and expansion. I haven't made it around to watching the series yet, but I hope to remedy that soon now that I have finished the book. I found it to be interesting and well researched. 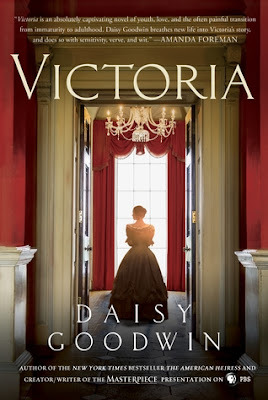 One Last Gripe: I wish there was another volume that would explain the next part of Victoria's life. First Sentence: A shaft of dawn light fell on the crack in the corner of the ceiling. I read this book, too, and felt like it made Victoria seem so immature. She was kind of a brat in many sections! We watched a few episodes of the series but it moved SO SLOW that I gave up. Sad because I really love British history! Glad to see this made your list :-) Read it due to already having read a lot of Tudor history. Yes, she was immature, but in the age, teens were considered adults.